The first book is about C. It starts with a description of a classical “Hello, world”-program, and briefly describes how such a program can be compiled, linked, and run. It proceeds with a description of variables and values, how values can be assigned to variables, and how variables and can be combined into expressions and computations, executed in sequence. Then, the concepts of alternative and iteration are discussed, and illustrated using if-statements, for-statements, and while statements. The combination of actions into larger pieces, called functions, is then discussed. Then, structured datatypes are treated, starting with arrays and lists, followed by the use of struct for creating data structures. The book concludes with an overview of the functionality available in C for performing mathematical and logical computations, and how the C standard library can be used for this purpose. The second book is about Java. It starts with a description of a classical “Hello, world”-program, and briefly describes how such a program can be compiled and run. It proceeds with a description of variables and values, how values can be assigned to variables, and how variables and can be combined into expressions and computations, executed in sequence. Then, the concepts of alternative and iteration are discussed, and illustrated using if-statements, for-statements, and while-statements. The combination of actions into larger pieces, called methods, is then discussed. Then, structured datatypes are treated, starting with arrays and lists, followed by the use of objects for creating inheritable data structures with associated behavior. The book concludes with an overview of the functionality available in Java for performing mathematical and logical computations, and how the Java class library can be used for this purpose. The third book is about Python. It starts with a description of a classical “Hello, world”-program, and briefly describes how such a program can be run. It proceeds with a description of variables and values, how values can be assigned to variables, and how variables and can be combined into expressions and computations, executed in sequence. Then, the concepts of alternative and iteration are discussed, and illustrated using if-statements, for-statements, and while statements. The combination of actions into larger pieces, called functions, is then discussed. Then, structured datatypes are treated, starting with arrays and lists, followed by the use of objects for creating inheritable data structures with associated behavior. The book concludes with an overview of the functionality available in Python for performing mathematical and logical computations, and how the Python library can be used for this purpose. “No, actually not”, I might answer, indicating with a little smile that I might know something you are not yet aware of. “?? ?”, you might think, wondering what I am talking about. “You see”, I would say, “I use this system called Books with Views, making it possible for me to write only one book, but it is a book containing more than one topic”. “Hmm, that sounds interesting. Tell me more!”, you might say. “I will try it right now!”, you now say, “and don’t forget to inform me about the release date”. Then you start your favourite browser or your favourite e-book reader, eager to see what this is all about. In a recent article – EXTRA ETHER: eBooks Gone in 5 Years? – brought to my attention in a tweet from Joanna Penn, the possibility of linking in to an e-book was discussed. In a Book with Views, this is possible, not because of the views, but due to the use of a common format, in which the book is written, and which then is used as the base for generating the different book versions – a web version, e-book versions in epub-format and mobi-format, and versions suitable for print – one for each of the views. It is possible to link in to a book, for example to a chapter, a section, but also to a specific figure, and to pages collecting meta-information, e.g. the page collecting all URLs used in the book. Of course it is always possible to link out of a book. This helps the reader to probe further, and it has also been pointed out recently by Seth Godin in What do you do when they don’t understand?. If a common format is used, software can of course help the author, to keep hyperlinks consistent between different book formats, and also to automatically create meta-information, like the page showing all the urls, mentioned above, or to a page listing all concepts defined and used in a book. In the drafts of books created so far, there are links inside the books between the views. The links are placed inside the book, at the end of each section. There are also links between the views in the about pages, e.g. on the about page showing the URLs used in a book. In the web versions of the books, there are also links in the sidebar of each page. Recently I added links between the views directly after figures showing code. As an example of this later feature, you can take a look at Figure 1 in Into Programming, where you can see the links to the other views. 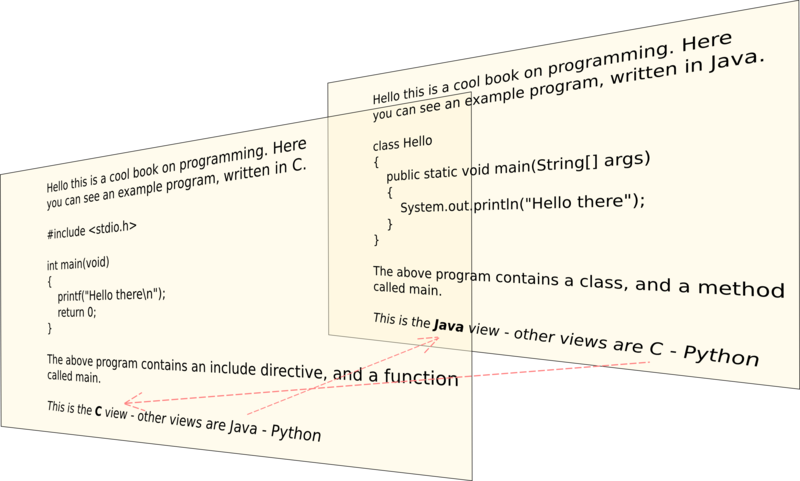 The links works as illustrated in this figure (click the figure to get a larger version), where some text and some code from a program, written in C in one view and written in Java in another view, is shown. As you can see in the above figure, parts of the text are common for both programs, and other parts of the text are different. The code of course is different, since that is the whole point of having these views, with one view for each programming language! The connections between the views are shown in the figure as dashed red arrows, corresponding to the hyperlinks you will find inside the book. I started a new book. It is called Into Embedded, and it is about embedded systems. It has two views (to start with), representing two processor architectures – 32-bit Intel-x86 is one view and ARM is another view. I wanted to test the concept of making books with views with one more book, and I also wanted to get started on the work of replacing an old book called Realtidsprogrammering – written in Swedish and not available in print anymore – with a newer version. And of course it gave me a chance to procrastinate (I recently read Turning Pro, so there is hope for a better situation), and finding excuses for not creating more content for Into Programming. Sometimes it is interesting to have equations in an e-book. Of course if it is a book on mathematics, but also in other books. I made an attempt to include equations in the book Into Programming, like this. can be used (together with the appropriate script tag to include MathJax) to create an equation. You can see the equation as equation number 5 on the About page for equations in the book Into Programming. Then, images can be created, one for each equation, using LaTex and the tool dvipng. You can see the result, in the e-books, in the Chapter called Again and Again. The books are found, as epub and mobi, on the Books page. The book Into Programming has pages that collect information about certain book items, like all the Figures and a list of the Concepts that are introduced in the book. These pages (I call this type of information meta-information, since it collects information about the book) have now been added also to the e-book versions of Into Programming. An e-book with views has been created! The content is the same as is currently available in Into Programming (which is not that much – it is more a proof-of-concept as of now – more content will be added later). I managed to create one mobi-version and one epub-version. The mobi-version has been tested on an iPad using the Kindle for iPad, and on an Android phone using the Kindle for Android. It seems to work as expected in both of these cases. The epub-version has been tested on an iPad using the Bluefire reader. It looks nice in this app, but external hyperlinks do not work. The epub-version does not open in iBooks. I am trying to find out why this is the case. The epub-version has been tested successfully however on an Android phone, in the Reader application and also the Aldiko application.